As a child growing up in a small Kentucky town, it was easy to understand and appreciate that food did not grow on grocery store shelves. We always had “community supported agriculture” because we would simply drive out to the family farms where we could buy most everything in season directly from the source, from vegetables to eggs. All you had to do was pick up what you wanted and either knock on the front door to pay or leave a little money there in the honor-system box. Nowadays, not only do our kids know less about where our food comes and how it’s produced, often times they miss out on the beauty of how fresh produce and fruit really tastes directly from the source at the point of harvest. Once you taste fresh foods direct from the source, everything else pales in comparison. Sure, we can buy watermelons and blueberries in February but the taste is almost always diminished because they were picked at a ripening stage designed for shipment over long distances, which still adds time between harvest and consumption. 1) Community Supported Agriculture (CSA): We’ll start with CSA’s as number one because these local farms are not only a food source, they are an incredible source of hands-on education in farming and environmental sustainability. Here in Naperville, the Green Earth Institute runs a 60 acre CSA farm out on Knoch Knolls Road just around the corner in South Naperville. They grow 40 different crops and make their fresh harvest available via their CSA farm which the general public can purchase a “share” each Summer. A share entitles you to either a weekly or bi-weekly portion of the week’s organic harvest which you pick up directly from the CSA farm. Our family purchased a share last Summer and often times during the season you are allowed to hand-pick a portion. The kids love the experience and just picking up our share was an education. However, the Green Earth Institute doesn’t stop there as they also offer children’s programs and volunteer opportunities. Click hereto learn more. 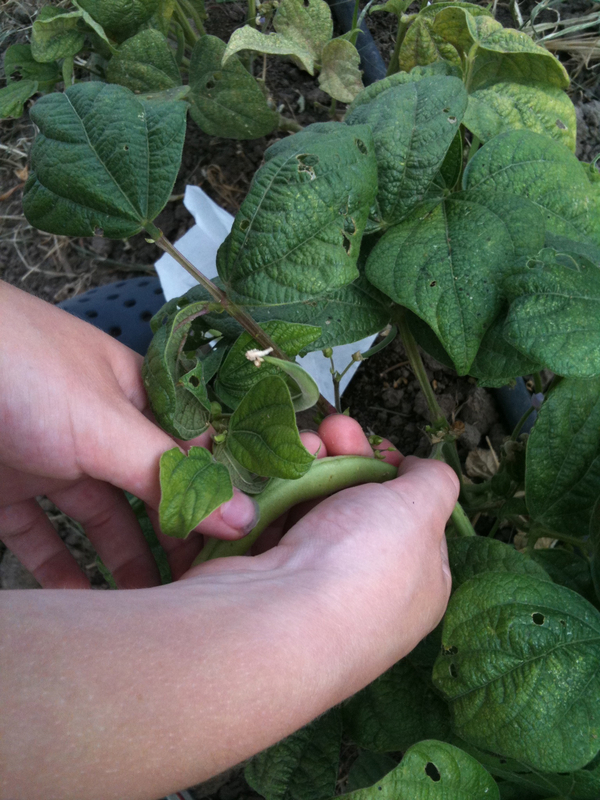 2) Naperville Community Garden Plots and Home Gardening: From your backyard to Naperville’s backyard, there are terrific opportunities to grow your own fresh harvest. The City of Naperville, through the Naperville Parks District, sets aside land over on West Street during the Summer months where you can reserve your own community garden plot and grow your own garden. Of course, with a myriad of garden centers in town, including Keller’s Farmstand, you can always set up a small garden at home either in the ground or using planters on your back deck. 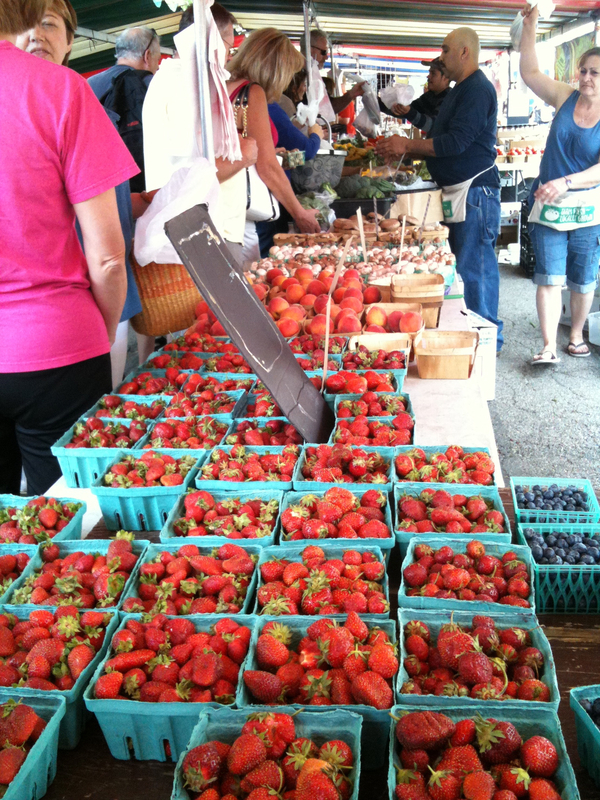 3) Farmers Markets… with a Caveat: Naperville and many of our surrounding communities offer Farmers Markets weekly during the warm weather months. 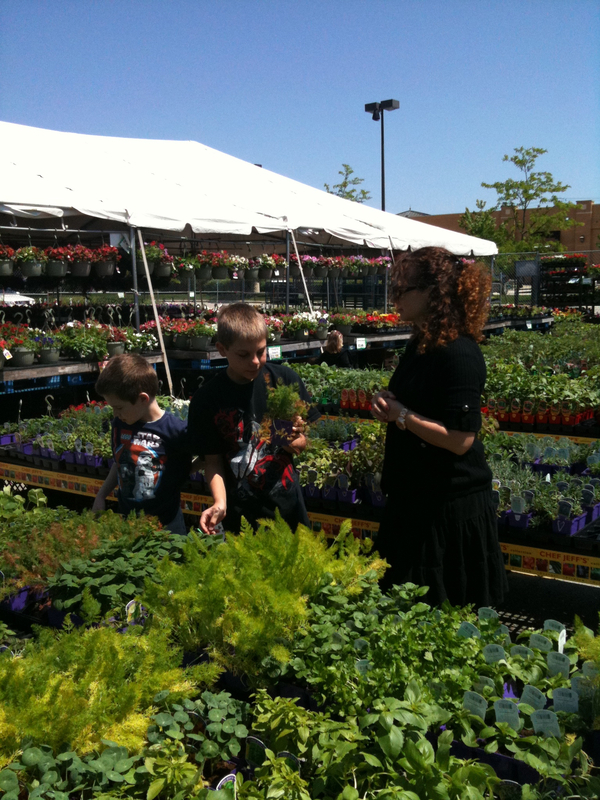 The Naperville Farmers Markets takes place in season every Saturday at the Fifth Avenue Station and, a newer addition, at Freedom Commons out by I-88. Wanna find the freshest local products at these markets? Simply ask the seller whether or not they are the actual grower. Buying from the actual grower, as opposed to a reseller, means you’re getting it direct for the source and supporting family farmers. 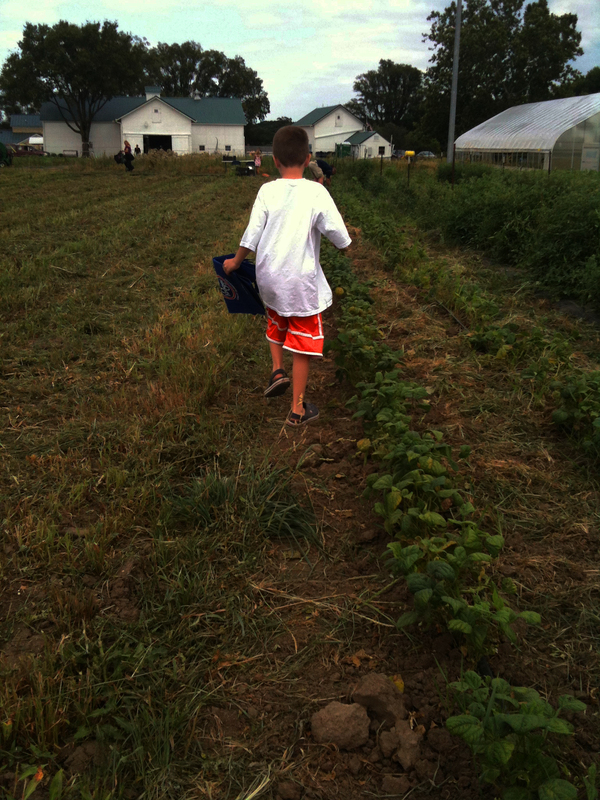 4) U-Pick Farms: From the western suburbs to Michigan, there are abundant options to take your family out for a fun day of harvesting your own local foods. Each year, our family heads to South Haven, Michigan to DeGrandchamp Farms to pick 10-20 pounds of fresh blueberries at a time. 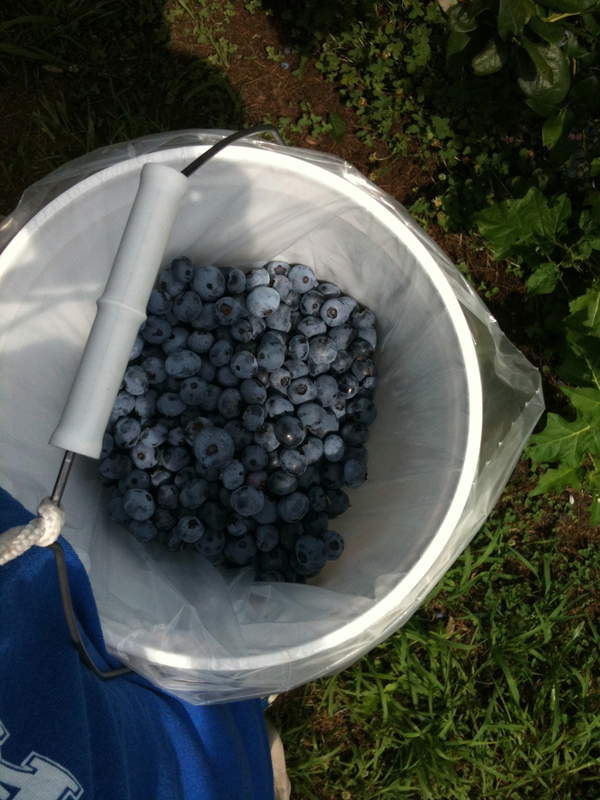 Don’t tell anyone, but we may eat one or two during the picking process. While we eat a ton of fresh blueberries during the Summer, which are as sweet as candy, you can also freeze fresh blueberries for the winter by placing them in a single layer on a cookie sheet, freezing them and then putting into a freezer storage bag. In the Fall, we head just out West to Jonamac Orchard to pick fresh apples right off the trees and enjoy some fresh apple cider doughnuts. 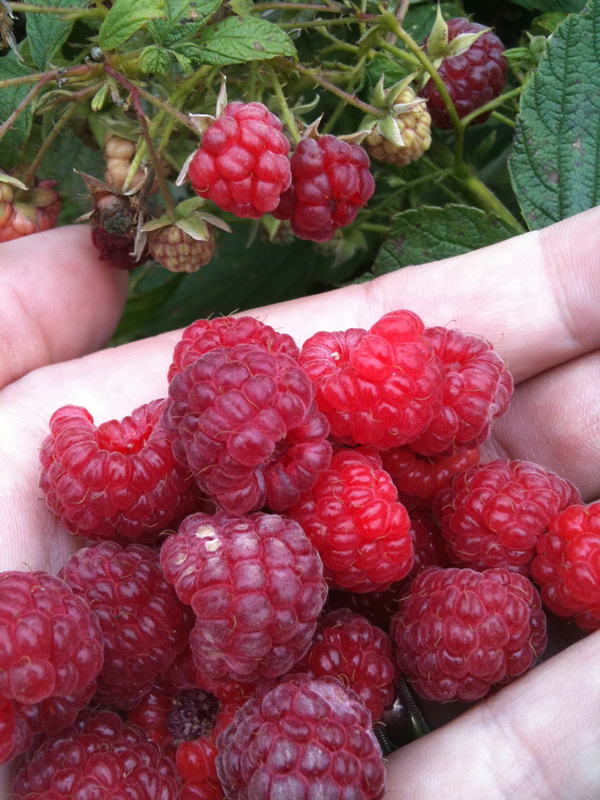 We also stop to pick fresh raspberries along the way from a number u-pick farms. 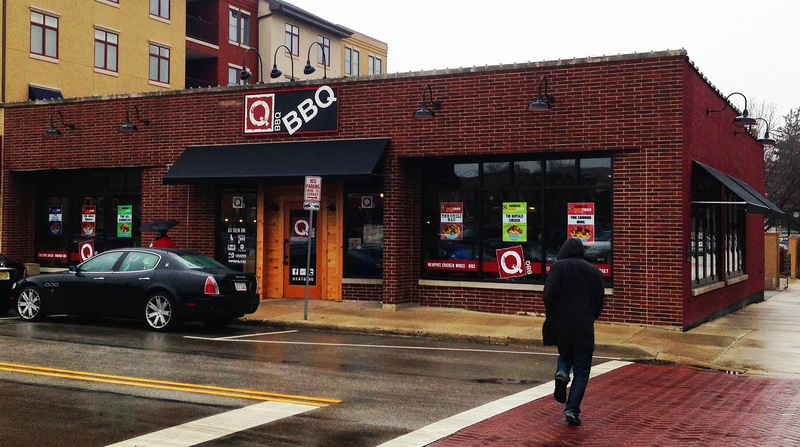 Needless to say, joy filled my heart last year when Q BBQ, based in LaGrange, opened its doors in one of my favorite places in the world… Downtown Naperville. The restaurant space is a wonderful tribute to the BBQ culture, with glorious smoke aromas that cover a multi-block radius, counter service, visible stacks of wood and walls adorned with framed pages from Wyatt McSpadden’s “Texas BBQ” coffee table BBQ photography book (a must have for BBQ fanatics). Since my first visit the first week of their opening last year, I’ve just about tried everything on the menu at least twice and they’ve really fine tuned their operation in terms of consistency and quality. The Q BBQ meat line-up is a deliciously flavorful salute to all the great BBQ regions, from your Carolina pulled pork complete with house made vinegar sauce to their Texas Brisket (chopped or sliced) and Smoked Sausage to their KC Burnt Ends. Did I mention ribs? I recommend their Memphis Sweet Sauce and you definitely don’t want to miss their more recent arrival… Smoked Turkey. Sides include a short list of perennial BBQ favorites, including fresh cut crispy fries and mac-n-cheese with a cheese-cracker crumbled topping. 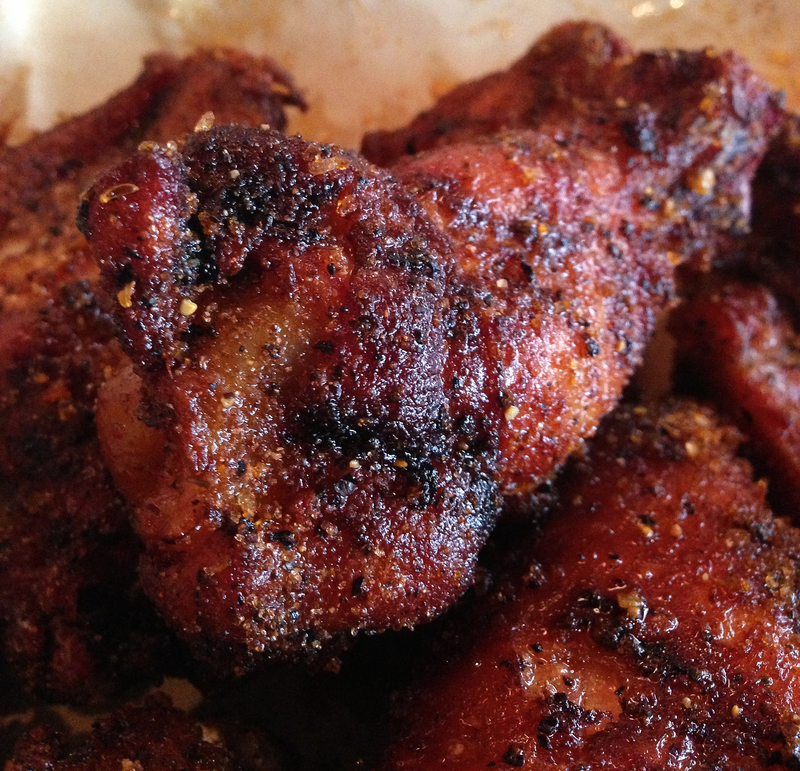 Memphis Chicken Wings at Q BBQ… heavenly! Aside from all of the above reasons to visit Q BBQ, there is one reason that has led to an almost weekly pilgrimage into Downtown Naperville for lunch… one reason this particular menu item should on the list of 100 things to eat before you die… one reason that surprised me immensely in my love at first bite… Q BBQ‘s Memphis Chicken Wings. Allow me to premise this obsession by saying that up until my first trip to Q BBQ shortly after they opened, I was never a big fan of chicken wings in general, but these little babies are different. First the wings are slow-smoked to lock in that heavenly flavor, then fried with a sweet rub applied while they are still hot (I presume). The result is a rich, smokey, lingering savory sweetness. At my small company here in Naperville, my colleague and I have declared each Friday as “Q Wing Friday”. Thanks to Q BBQ for bringing real deal BBQ to Downtown Naperville and to everyone else… go to Q BBQ and order some of those wings… I usually do the two-meat Q plate and add the smoked turkey. In 1931, during Naperville’s Centennial Celebration, an old quarry was converted into an instant community Summertime treasure. 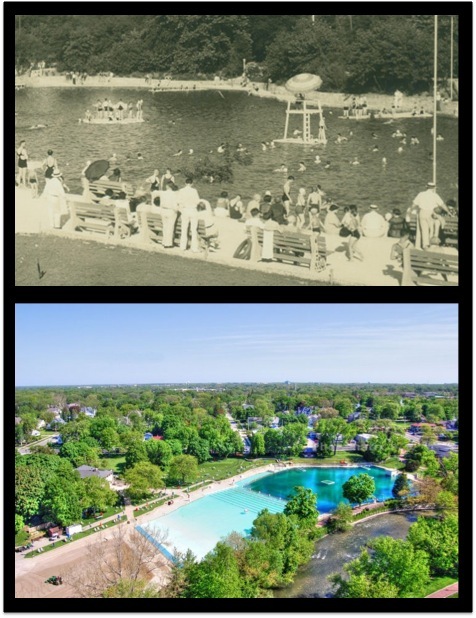 Napeville’s Centennial Beach is truly a one-of-a-kind nostalgic treasure and we can thank our community and incredible Naperville Parks District for all their efforts in keeping this tradition alive. One of our favorite Summer traditions is to pack up a picnic and head out after 5pm on a sweltering weekday with the family when the crowds have dwindled a little. After that, it’s always fun to make the short walk into downtown for a little ice cream or indulgent cookie dough at Cookie Dough Creations. My youngest son, pictured in the middle, has found his passion in theater through Kidz Kabaret. As any parent knows, no two children are the same. As a matter of fact, its been my experience that siblings tend to be opposite in personality, interests and behavior. As a parent, my dream for my children is for them to discover their own unique dream and support them as much as I can in their journey. While my oldest son is a natural-born competitive athlete, it’s been a process of elimination for my youngest son in his journey to discover his own unique niche. Over the past few years, we’ve worked our way through soccer, t-ball, cub scouts, coach pitch baseball, football and pottery. He loved the pottery class he took through our incredible Naperville Parks District and this Summer took the leap, participated in a Theater day camp at Kidz Kabaret here in Naperville and fell in love. The one detail I’ve left out is the fact my youngest son is a pretty shy kid and often struggles in relating and communicating with other kids. Of course, once he gets comfortable just sit back and enjoy the entertainment. Kidz Kabaret and its 501(c)(3) Fair Lady Productions is a Naperville-based non-audition children’s theater company that began in 2003 as a summer stock performance in Executive Director Kandiss Hernandez’s backyard. Today, their facility on Quincy Avenue is pretty incredible in terms of its size, theater and rehearsal space. “Non-Audition” means every kid gets a chance to perform even if that means having 15 different casts each with their own performance date. 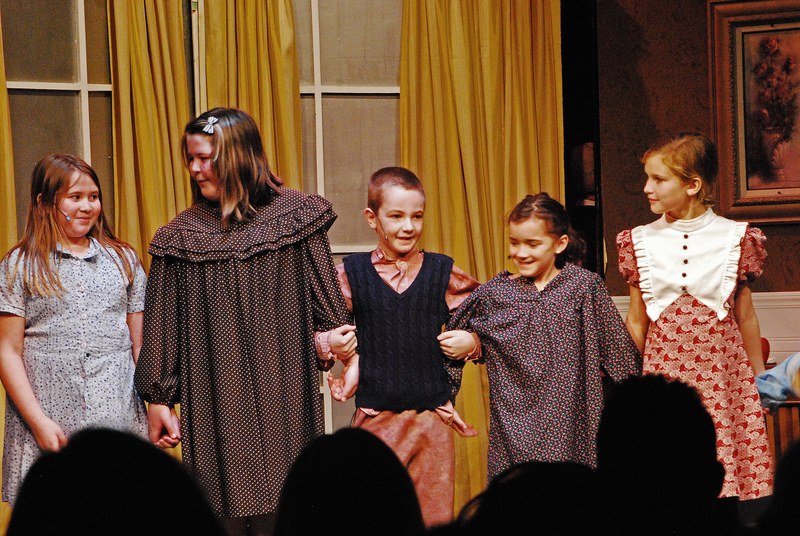 They focus on helping kids develop self-confidence while learning the many exciting aspects of theater production. For my son, the Summer Theater Camp “Aladdin” performance at Kidz Kabaret led to the Fall program where he performed in “Annie Jr.” to the Winter program where he just finished “It’s a Fairy Tale Life” heading toward the Spring Program. We were pretty amazed by how well these pint-sized triple threats were able to put it all together with the support of the Kidz Kabaret teachers. Even more, we were blown away to see our little shy guy acting and singing solos… on a stage… with bright lights… in front of an audience. It’s all the more comforting to see the absence of competitiveness and the sense that the biggest stage Kidz Kabaret is preparing our children for is the stage of life… to help them build confidence, commitment and discipline… to learn how to communicate… to work together as a cast… to express themselves and to enjoy the arts. That’s about as much as a parent could ask for. While there are plenty of great performance arts programs and activities in and around Naperville, I’m particularly grateful for the efforts of the whole crew at Kidz Kabaret. Special thanks to De! 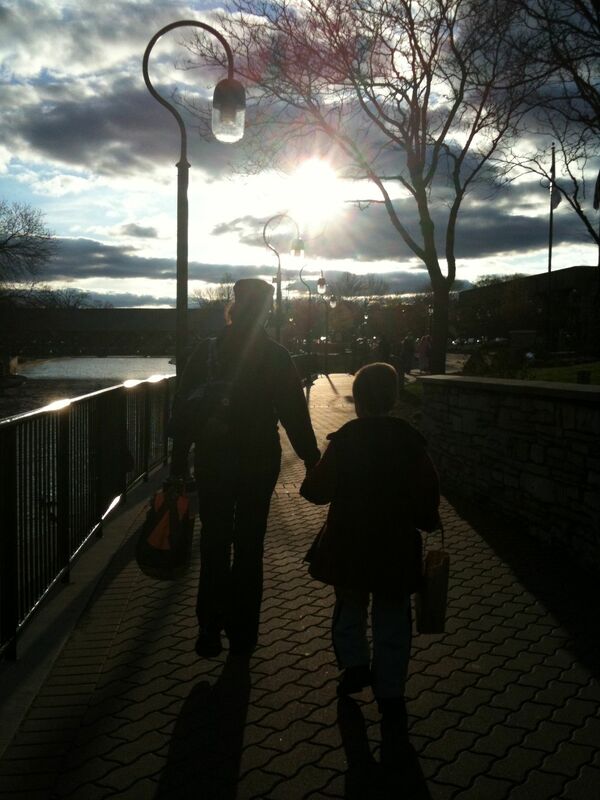 World of Naperville is Back – 143,542 Visits Strong!!! On May 26th, 2006 I first wrote my inaugural post in welcoming everyone to the “World of Naperville”. This blog was born out of my frustration of feeling disconnected from the the incredible “can do” community I chose to live in and raise my family craving a sense of my former small town roots. My daily commute was very long and there were many days during the winter months I never even saw Naperville by daylight during weekdays. For the next 4 years, I would continue my plight to stay “virtually” involved and invested in Naperville by being a voice that documented all of the heart and soul of our community from the perspective of someone who actually lives here. In this time, I’ve done everything I could to contribute my passion and talents to our community. I shot and directed a documentary film about Ribfest, I’m working on a longer term documentary film about an internationally-renowned local arts icon in the world of opera and ballet, I participated in the Naperville Citizens Academy, I’ve coached little league football, exhibited my Naperville photography including 4 commissioned photos that hang in the lobby of a corporate building on Diehl Road, I’ve volunteered at my children’s elementary school, I’ve delivered a school assembly presentation about being a composer, I’ve worked with local restauranteurs producing food-based media and have observed many things that have changed and some that have not changed at all. I’ve seen the prosperous times and the heartbreaking lows impact our community. Over the past year or so, my posts have declined for a very good reason. I started my own company and now work here in Naperville on a daily basis. But now, I feel I’ve grown distant from my community by spending a little too much time in the office disconnected. So two things are happening, first I’m renewing my mission to publish this blog and second, in the next couple of months I’m moving my office into Downtown Naperville inside the walls of one of the oldest buildings!!! I’m very excited about the road ahead and hope you will stay tuned for more insights and observations from the World of Naperville.